While everyone is scared about not getting enough protein, most dieters are equally scared about getting TOO MANY carbohydrates. So let’s take a look at proper carbohydrate intake when using the Easy Veggie Meal Plans to lose weight. The FIRST rule is to build your diet based around fruits and vegetables. Not only are they loaded with fiber, but also with vitamins and minerals. The fiber in fruits and veggies give you long lasting energy throughout the day, rather than a spike and crash energy level like processed carbohydrates from a box. Plus, fruits and vegetables are low in calories and easy for the body to digest. Of course, there are many vegetarian carbohydrates to AVOID, including white flour breads and pasta, white processed rice, crackers, cookies, and soda. All of those are refined foods, meaning they have been stripped of many nutrients and fiber. As a result, refined foods contain a lot of calories per serving and do NOT fill you up. Plus, they often have more sugar and even trans fats added to them, making them not only unhealthy but also fattening. So stick to fruits, vegetables, and un-refined whole grain products. This will give you lots of fiber, and fiber helps keep you full and has many health benefits. Fiber helps lower risk of high blood pressure, diabetes, heart attack, heart disease, constipation and colon cancer just to name a few. Soluble fiber absorbs water creating a gel like substance while being digested. It helps you feel full longer, yet is easy to digest. Insoluble fiber doesn’t absorb water and it stays intact as it passes through the intestines to help with regular bowel movements. 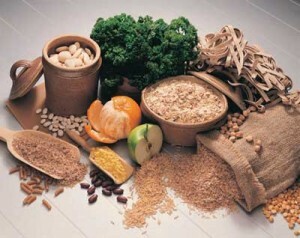 Soluble fiber sources include oat bran and nuts, while insoluble fiber includes most fruit peels and vegetables. As fiber passes through the intestines it acts as a “broom” and picks up toxins and fats. It can absorb up to 100 times it weight, and helps lower cholesterol. Fiber intake has been associated with a lower risk of colon cancer as well. The carbohydrates you’ll eat on the Easy Veggie Meal Plans are NOT evil. In fact, you’ll be able to eat a lot of carbohydrates – about 50% of total calories – and you’ll still lose weight and get rid of belly fat. Just make sure to avoid processed foods from a bag or a box at all times – with the exception of the odd treat – and you’ll get slim on a “Good-Carb” diet! Great idea. I don’t have it posted but you can strawberries dipped in raw chocolate. I don’t have the raw chocolate recipe written down. but here’s what you need. raw cacao powder, raw coconut oil, agave nectar, vanilla extract, dash of salt. melt coconut oil over stove flame in a coffee cup. then add rest of ingredients to taste. refrigerate after you make chocolate to harden it. Hi Kardena ! Glad you addressed this topic. Usually meal plans ( non vegan / non vegetarian ) insist on 40% protein / 35% carbs / 25% fat , to lose weight. This is not always possible with vegan/ vegetarian plans since vegetables , legumes, beans have carbs along with protein & fiber. I am a vegetarian and am constantly concerned because I can’t make the 40/35/25 ratio. While 25% fat is not a issue the carbs & protein ratio always concerned me. Glad to know that i dont need to feel guilty or concerned about eating plant based carbohydrates and that I will still lose weight ! Is there a specific ratio you follow for carbs / protein / fat ? the ratio I use is around 20-30% pro, 45% carbs, 30% fat. It’s about keeping your calories in the right range for you that’s important too. How much calories you burn in a day versus how many you are consuming. look up your BMR to see how many calories you burn in a day, then reduce your calorie intake by between 300-500 a day depending on how quickly you want to lose weight and what your current weight is. You need to be in a calorie deficit of 3,500 calories to lose 1 lbs. of fat.